As per the data provided by the BLS, the average annual and per hour CNA salary in New Mexico was $26,010 and $12.51 respectively, in May 2013. The total number of CNAs employed by the state was 5,670. Employment per 1000 jobs was 7.23. According to the information provided by indeed.com (as of January 2015), the average salary of nursing aides in NM was $21,000 which turned out to be 13% lower than the average salaries of these employees for job postings all over the country. Facilities such as home health, nursing home, etc., provide less salary in the starting; however, after gaining a valuable work experience, you can expect a heavy paycheck. The table gives details of certified nursing assistants in New Mexico based on different percentile brackets. 90% of CNAs were waged less than $35,490; 10% were offered more than $35,490. 75% of certified nurse assistants earned less than $29,490; remaining 25% earned more than $29,490. 50% of the employees made less than $24,550; rest 50% received more than $24,550. 25% of CNAs were paid annual wages less than $21,250; 75% were paid more than $21,250. 10% of employees were salaried less than $18,930; 90% were salaried more than $18,930. As per the figures provided by salary.com, Rio Rancho and Albuquerque offered the highest salary to CNAs while Roswell remunerated nurse aides with the lowest amount. The median annual salary in New Mexico ranged from $28,313 to $17,258. 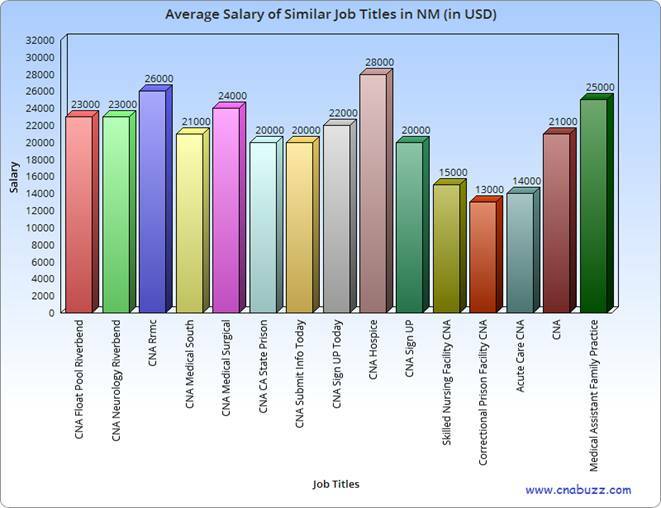 If you wish to work in NM, have a look at the complete salary details of CNAs employed by the state. The earnings of CNAs primarily depend upon the designation they hold. In January 2015, the state offered $28,000 to the CNA Hospice, $26,000 to CNA Rrmc. Salaries of other personnel’s range from $13,000 to $25,000. The employment outlook of certified nursing assistants is predicted to rise by 21 percent, as per the reports stated by the BLS. The job outlook of CNA in state till 2016, on a whole, fluctuates between 11% (in South) to 30 % (in North). If a nurse aide holds specialization degree in fields like emergency medicine or geriatrics, then job security is slightly better. Assistants, who are aware of the new standards and latest technology will find jobs more easily. Question 1 – I’m planning to move to the state of New Mexico in a couple of years, what average salary can I expect working as a CNA? Answer – As per the data provided by the indeed.com, the certified nursing assistants can expect an average salary of $21,000 per annum. Question 2 – I’ll be completing my certification next month, I was wondering if anyone knows the highest paying job titles. Answer – The highest paying job title in the state of New Mexico is CNA Hospice with an annual salary of $28,000. Other job titles paying good salary include Medical Assistant Family Practice ($25,000), CNA Rrmc ($26,000), CNA Medical Surgical ($24,000), CNA Neurology Riverbend ($23,000), and CNA Float Pool Riverbend ($23,000).